Conquering compliance is no simple task, but it can be made easier with a user-friendly LMS. Join us on a journey through regulations, learning culture, and engagement to find out how your organisation can make the most of compliance training. First an introduction - who are Kallidus? A little bit about us, our services, our experiences with compliance, and how our user-driven philosophy can help you get the most out of compliance training. Rules, regulatory bodies, and how an LMS fits into the bigger picture of risk mitigation and usability. Learning objectives are huge motivators. But what makes a strong objective? And how can they tie in to both individual and organisational needs? Five key questions to consider when renewing or creating your compliance strategy to help fine tune and get the most out of it. A guide to fitting compliance into modern schedules, how it can impact learning culture, and ten top tips for compliance success. We're assessing the impact technology can have on your compliance training, the importance of good UX, and we've supplied a checklist for assessing the usability of your LMS. From the colour of your buttons and placement of menus to personalising the experience for your learners, the user-friendly factor of your LMS can be leveraged for a wide range of advantages. Compliance matters, for the simple reason that the regulatory framework which is set in place establishes the authority of your company. And adhering to it means avoiding serious financial penalties, bankruptcy or criminal prosecution. Non-compliance is never really an option. Many companies lack the perfect tool to implement and conduct every part of the compliance procedure. Whereas you might have a wonderfully set regulatory body in place, you still need your employees to be well informed of all its content in order for them to stick to policies. 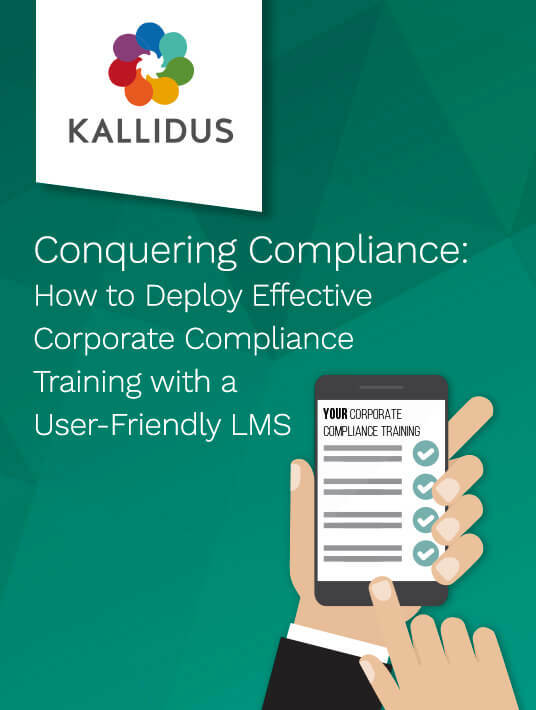 Kallidus' main focus is making sure that this training happens in a fun and engaging manner, which inevitably helps you manage compliance better and most importantly, mitigate any kind of risk.